A childhood dream to write a book has finally become a reality for Teesside University academic Gabrielle Kent. Gabrielle, Senior Lecturer in Computer Games Development in the University’s School of Computing, has worked in and around the games industry for twenty years. But as an avid reader, she’d always had a passion for writing and dreamed of writing her own book. And now having signed a three-book deal, Gabrielle’s debut title is due to be on sale from June. 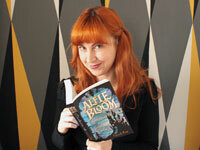 Alfie Bloom and the Secrets of Hexbridge Castle, published by Scholastic UK, will be the first in a series of novels. The series will follow 11-year-old Alfie who inherits a castle and discovers he is the guardian of an ancient magic which others seek but should never be used. With the help of his two cousins, a shapeshifting solicitor and a flying bearskin run, Alfie must ensure the secrets of Hexbridge castle stay secret forever. Gabrielle said: “I’ve always loved reading and wanted to write a book since the age of six. I started writing this story about 10 years ago, working on it during the summer months. Once I’d finished it took around two years to secure an agent, who helped me to find a publisher. Scholastic have gone on to sell the rights to France, Germany and America. There are also plans for a spin-off web game based on Alfie’s story and Gabrielle has set the MA Concept Art students a brief based on the book, to give them experience working for a live client. As well as teaching, Gabrielle also directs Teesside University’s annual Animex games and animation festival, which attracts the cream of the animation and games industry who give talks and hold workshops. Alfie Bloom: The Secrets of Hexbridge Castle was short-listed for both the Northern Writer’s Awards and recognised by literary magazine Mslexia's Awards in their unpublished categories. An excerpt from the novel also won the Friday Night Live Award at the 2013 York Writer’s Festival. A childhood dream to write a book has finally become a reality for a Teesside University academic.